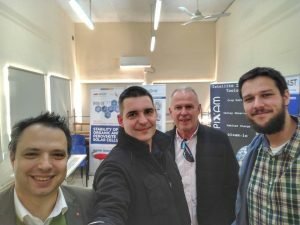 Dr Ljubomir Vračar and Dr Vladimir Sibinović from the University of Niš, Serbia visited MCAST Energy for collaborative research endeavours in energy harvesting, IoT, prototyping and engineering education. Photo with Dr Inġ. Brian Azzopardi and Velislav Baran from MCAST Institute of Engineering and Transport.